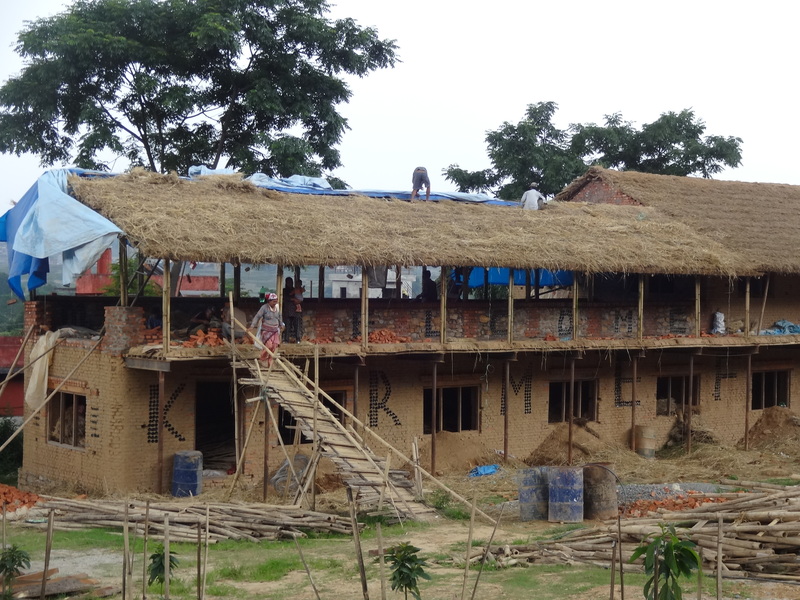 The Kevin Rohan Foundation, here in the Kathmandu Valley, does amazing things for the local community. I visited them recently and watched as the final stages of their community-built town hall was coming together. 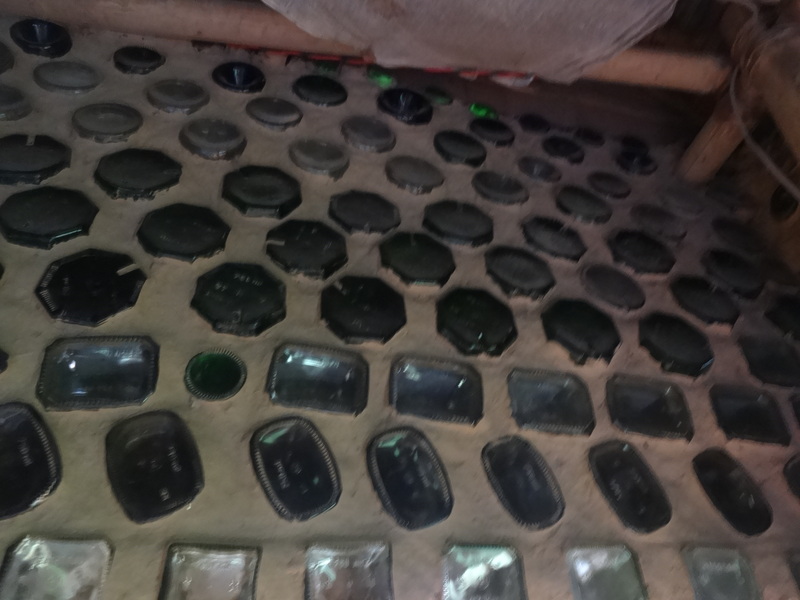 This massive structure was built by locals from bricks they had fired and, amazingly, the walls incorporate recycled bottles to give them strength and let in light. 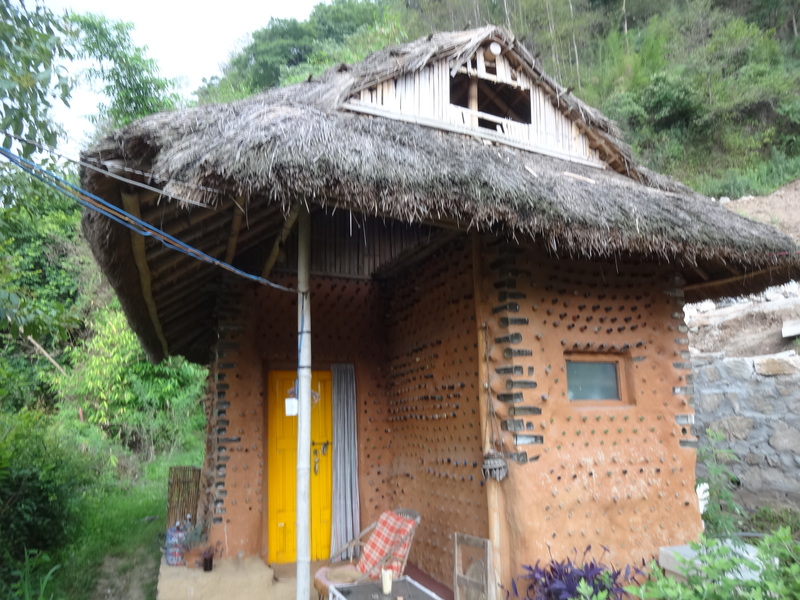 Bottle houses are strong, cheap to build and eco-friendly. The whole community is a fantastic example of what can be achieved with team work, commitment and the clever use of what you have. The community townhall coming together. The letters you can see are the initials from the Foundation’s name spelled in bottles. At night – if there is power- the name will be lit up through the glass! A bottle wall up close. The little version of a “bottle house” Here the bottles are reversed with the necks facing out. Its less attractive that the bottle bases but the light inside the house is fantastic! Sleeping babes! Even the local nursery building is constructed from bottles. This post participated in the Weekly Photo Challenge: Achievement. This is so hopeful! and so beautiful! I especially love the bambinos sleeping in a row in the nursery. I got there at nap time and was terrified of waking them up, so I didn’t get the best pictures, but it was adorable! How cool is that! Thanks for highlight what sounds like a great group! They really do a lot. I didn’t get great pictures of the community garden or the livelihood project which creates income for women, so I didn’t feature it, but it was very impressive. On lots of levels. The founder was telling me they can build a small home for about $300. Wow, I never knew one could build a house with bottles. It’s a brilliant idea. Simple yet innovative. Neither did I. Since then I have found houses that are also made from plastic bottles. They fill the bottle with dirt and make mud and let it dry. Then they have what are essentially mud bricks to build with. Very smart! What a great idea. I have a friend who volunteered for Habitat who build practical eco homes globally, and said it was an amazing experience. But seeing those babies sleeping so sweetly together Aww. Love the idea the the bottle letters lighting up at night too! Great community achievement! One of the best things about being here is discovering creative people who do things like this. Brilliant! What a great concept. Thanks for sharing. Judy’s comments capture similar feelings that I had after reading your post. This is truly humbling- and inspiring. The idea of the bottle houses makes me think of wooden ships that have glass prisms built into the upper decking to filter light into cabins below deck. I dream of one day building a studio space next to my house… this gives me some ideas! I think it would be a great idea to try your own construction. The photo of the inside wall (with the sleeping babes) doesn’t really do the lighting justice. Its really a lovely effect and very practical here as a cheap and effective way to light a room. After experiencing the deck prisms in the old wooden sailing vessel … I understand what you mean. I was surprised by how much light they focused and they were about 4 inches wide… cut with facets like big diamonds. Just thought of a question- are the bottles corked in some way to keep insects from setting up house? Interesting that you should ask. I asked the same question. Maintenance and preventive measures aren’t really a concept around here, so I got a blank stare. But I think they could potentially be insect breeding grounds. A cork would probably do the trick for a while, but I would absolutely seal them. Maybe with a resin? Thank you for checking on this. I agree, sealing to avoid insect seems like a good idea. Maybe gluing a large glass marble would be an idea so light transfer wouldn’t be impaired.